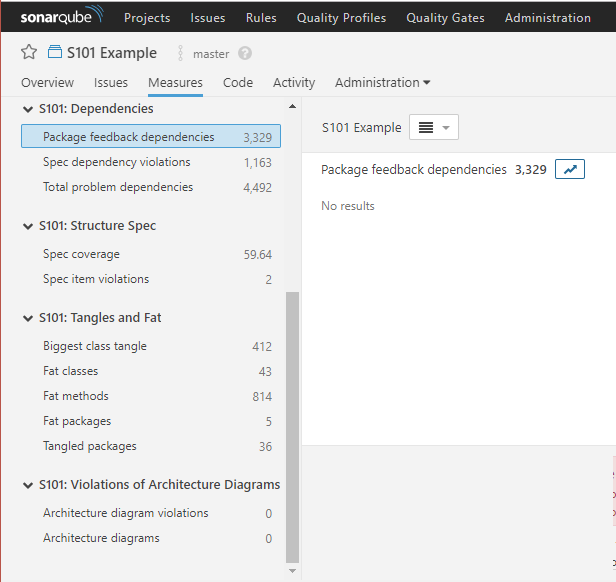 The Structure101 Key Measures can be reported via SonarQube. The configuration to do this is straight forward and can re-use an existing Structure101 Build configuration file. It is assumed that SonarQube Scanner is already configured within your maven build. The plugin is installed by copying the sonar-structure101-plugin.jar file to the SonarQube extensions/plugins folder and restarting the SonarQube daemon. If you have an existing Structure101 Build configuration file this can be used by the plugin requiring just the structure101.java.headless.config property to be set. The structure101.java.disabled property should also be set to enable the Structure101 scanner. If a build configuration file is not used then the repository and project must be defined.